Welcome to SBA Roll Shop Solutions! SBA offers solutions for roll grinding problems in the paper and steel industry. Our new roll grinders benefit from years of experience gained in various successful modernization and retrofit projects of all known brands. We offer extensive support and training for the implementation of new grinding technologies. 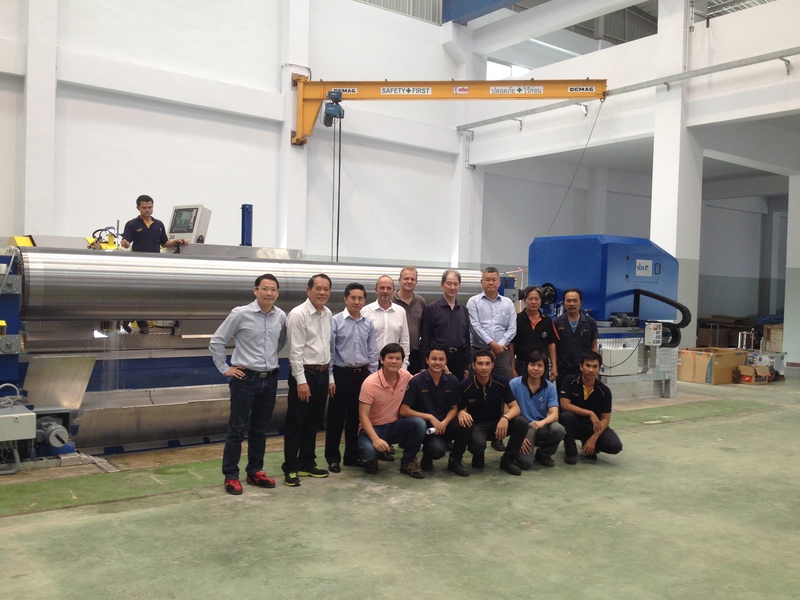 SBA has installed its first new roll grinder in Thailand out of its own manufacturing. The Customer, Bangkok Roller is a leading service provider of coated rolls. The SBA roll grinder is 13.000mm long and able to grind rolls up to Ø2.000mm. The maximum work piece weight is up to 50 tons. A wide range of accessory parts and auxiliary equipment enables the machine to cover all grinding requirements/tasks in one clamping. Highest flexibility in shortest set-up time guarantees highest productivity and minimizes machine shut down time and risk of failure. The new SBA roll grinder enables the grinding of rolls for the paper , steel and non-ferrous industries alike and ensures best quality of the end product. The machine features the latest control- and drive technique. Finally this project has been completed to the full satisfaction of Bangkok Roller once again. Sba received two package orders from ArcelorMittal Asturias. The first order is part of a modernization program of the complete hot mill roll shop. SBA will upgrade three roll grinders one by one. A Waldrich roll grinder used since 1992 for backup rolls and roughing mill work rolls will be modernized especially on the roll support side. This also requires a Morgoil lubrication system and lifting tables to accommodate various sizes of BUR chocks. Modernizations are also required for two Waldrich grinders in the finishing mill to grind work rolls together with chocks. As a special feature Sba will install chock rotating and supporting technology. The second order is placed for the cold mill roll shop and covers a major upgrade of a Farrel grinder for backup rolls and a full modernization of a Waldrich work roll grinder. All orders cover a complete replacement of obsolete LT and KPM control systems by our latest SBA Grinder Control SINUMERIK 840Dsl, complete new electrics and integration of measuring systems like • Profile measuring and correction during grinding • Eddy current measuring • Ultra sonic measuring • Surface wave measuring. We would like to thank the Acrelor Mittal team for trust in SBA. SBA received next order for one of the longest roll grinding machines on market. A remarkable machine bed length of 21 m will provide a traversing range beyond 17 m. Latest paper machines are coming along with bigger rolls of up to 15,000 mm in length and up to 2,300 mm in diameter. Maximum weight of this giant rolls can reach 120 to in total. Fast developing roll cover materials require newly designed accessories, but also different grinding technologies for highest performance, accuracy and quality. Therefore Lee & Man Paper counts on our skilled roll grinding experts in terms of training and support to master their future challenges. After two successful revamping projects at voestalpine, we proudly anounce the receipt of another order for a complete modernization of the HSM WR roll grinder WS1400. The preceding projects were a HSM BUR roll grinder WS1800 and an Innse HSM WR roll grinder. SBA Roll Shop Solutions takes part in this year’s congress and exhibition at CONAC in Monterrey, Mexico: October 3rd – October 5th, 2010 CONAC, Centro Convex — Monterrey, Mexico We are glad to show our roll shop solutions in cooperation with Grupo Capsa, our renowned partner for high-tech roll equipment. As you may already have noticed, besides the English and Chinese version (中文版) of our site, we’ve made the entire content also available in German. SBA Alternativenergie, our division for alternative energy heating systems, has also got a website (German only) now. We welcome your feedback and will strive to further improvements. We are happy to announce that besides the English, now also the Chinese version (中文版) of our site is online.